A big “Welcome Back” is in order for Florida Panthers Ed Jovanovski and Scottie Upshall after a successful return to the lineup, wouldn’t you say? Both played Saturday night in the Cats’ 5-4 win over Nashville, and while the pair’s arrival may not be a “put them over the hump” moment, it should signal some improvement as the club heads to Montreal for its third game against the Canadiens in three weeks. How long has Jovo been gone? So long that his name didn’t even pop up under “Tags” when I started typing it. That long. Longer than this blog’s existence. The captain Jovanovski was rock solid in his season debut after being sidelined with a hip replacement. Jovo logged 15:54 of ice time and was a plus-3 for the Panthers (16-20-6). The most telling moment for me was when Jovo grabbed the puck and led a headstrong 3-on-2 rush in the third period. With Florida up 4-2 at the time, Jovo displayed the knowledge of a veteran who was aware of the game’s situation: He dished the puck to one of his forwards, let them move in on Predators’ goal and quickly backed out, choosing not to get caught too low on the play. His performance against Nashville is the type of play Florida needs from Jovo, especially with Florida’s most interesting pairing, Erik Gudbranson and Dylan Olsen, out with injuries. On Saturday night against the Capitals, Minnesota’s Ryan Suter stole the show by becoming the first Wild defenseman to every record a hat trick in the team’s 5-3 win. Jovo does not have to be that guy. He just needs to be a reliable leader. If Saturday’s play is the standard this new and surgically improved Jovo has set, interim coach Peter Horachek will be just fine with that. Jovo’s presence as a leader is immeasurable, but his addition to the blue line is sorely needed. Florida’s defensive corps has demonstrated a tremendous inability to clear the puck at times, and turnovers like Dmitry Kulikov’s that led to Nashville’s second goal by Mike Fisher will haunt the offensively challenged Cats. Jovo should help remedy those problems. Upshall’s return after a three-game absence should be just as significant as Jovo’s. The winger put together a strong November, scoring 12 points in a sizzling 11-game stretch late in the month. Uppy wears his emotions on his sleeve and has benefited the most by the departure of former coach Kevin Dineen and arrival of Horachek, and his importance to the club runs deep. Sure, Uppy’s going to take an untimely penalty on occasion, but he’s also more than likely to keep a play alive, do some of the dirty work that’s often necessary to turn close losses into close wins and is an emotional leader. He may be the most hot-headed Cat on the squad (and occasional water bottle squirter from the bench), but every team needs a player like that. Welcome back, guys. Florida is already better for it. FITTING END: Kopecky’s game-winner in the shootout was his second in less than a month. And Saturday night’s ending was only fitting after the way a strange New Year’s Eve played out at BB&T Center. That game against the New York Rangers was an odd one, starting with the 5:00 start. Florida seemed to have victory in hand and led throughout before Kopecky made the horrible mistake of vacating his defensive position in front of Tim Thomas to go get a stick from the bench after dropping his. New York’s Dan Girardi blasted the tying goal past Thomas from the spot where Kopecky was. The scene in the dressing room afterward was also strange. While interviewing Brad Boyes, the media was interrupted by new owner Vincent Viola, who wanted a word with his players to close out 2013. While the media questioned Kopecky’s decision – one that Horachek called “a little bit surprising” – the interim coach came across somewhat uncharacteristically short with the media. It’s understandable considering the circumstances of the loss, and let’s face it, you just don’t expect a two-time Stanley Cup winner and player who’s approaching a decade in the NHL to make such a rookie gaffe. So from a redemptive standpoint, it just made sense that Saturday’s game-winner came, like it did against Washington last month, deep in the extra session from Kopecky, who improved his shootout record to 3-for-7 when he roofed his shot in the bottom of the sixth round over goalie Marek Mazanek’s glove. It almost made the two-goal lead that evaporated late in regulation forgettable. HIGH FIVES: The number five played a prominent role in Florida’s win to close out – yes – it’s five-game homestand that ended 2-2-1 after starting with regulation losses to Tampa Bay and Detroit, a good win over Montreal, the extremely disappointing shootout loss to the Rangers and the weekend win over Nashville. Sean Bergenheim has five goals in last five games. His linemate and fellow Finn Aleksander Barkov carries a five-game point streak to Montreal for Monday’s game. The pair’s line – the B Line – had five points in the win over Nashville. Finally, Jonathan Huberdeau tallied the fifth multi-assist game of his career. KICK SAVES: The Panthers are facing the Atlantic Division-rival Canadiens for the 77th time, holding a 36-26-6-8 career advantage. Florida is 16-12-3-5 in Montreal…Florida is 6-3-1 in both their last 10 games and last 10 road games, and is 9-4-1in their last month of play…Barkov’s five-game point streak is tied with Upshall and Olsen for the longest this season…Brad Boyes has a three-game point streaking (2-2-4). 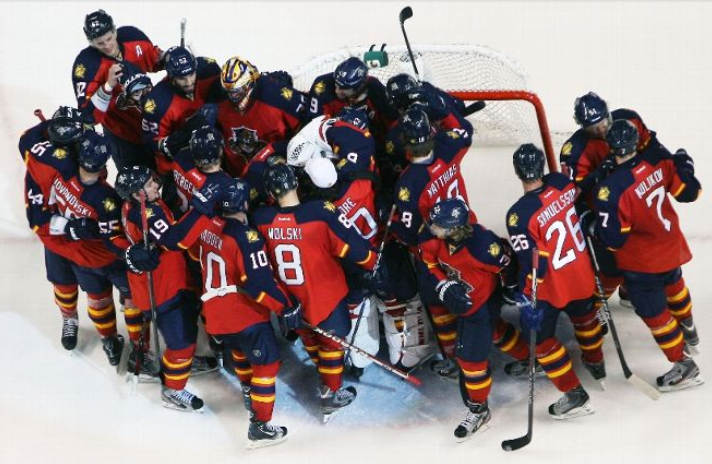 SUNRISE – Florida’s Tim Thomas and Brad Boyes put themselves in position to be the stars for the Panthers in their New Year’s clash, but the New York Rangers put a damper on the festivities to close out 2013. Before 16,083 fans at the BB&T Center, New York scored late to tie it and won the shootout 1-0 to earn a 2-1 win over the Panthers in what could only be described as a disappointing loss to the home team. “It was a hard-fought 65-minute game and they won the shootout. You just have to move on from that. Timmy played pretty well,” interim head coach Peter Horachek said. Thomas, making his 400th career start, did play well in his return from an eight-game absence due to a groin injury. He made 30 saves on the Rangers, including four in overtime, and put the Panthers (15-20-6) in position to hold a two-game winning streak heading in to 2014. “I felt really good for a first game back,” said Thomas. “It was one of those nights where if I could see it I could save it. I thought we were going to hang on until the end there, but that’s hockey. However, Dan Girardi blasted a shot from inside the left circle after Tomas Kopecky left the ice after simply dropping his stick while trying to get the puck. Girardi’s third goal on the pass from Derek Stepan with just 2:10 left in regulation sent the game to overtime and left Florida a bit deflated. “There are different theories to that. It’s a little bit surprising that he would go there. A lot of teams would say go get your stick and hold the ice, but I don’t think that was a great time when the puck was behind the net because if you leave that area obviously there’s a big area open,” said Horachek. The turning point for Florida occurred when Brad Richards went off for four minutes after high-sticking Nick Bjugstad and drawing blood at 7:47 of the third period. Florida, though, could only muster one shot and generated very little time in front of Lundqvist, rarely coming away with much zone time, which bothered Horachek. “We don’t relate it to how many shots we had. I’m relating it to puck possession, and they block a lot of shots. I’d say it’s more about how much possession time we had which would be the disappointing part,” Horachek said. New York (20-19-2) netted the only goal of the shootout when Richards beat Thomas high on the stick side in the third round after the goaltender had denied Mats Zuccarello and Stepan. Florida failed to score in the shootout as Lundqvist denied Aleksander Barkov, Jonathan Huberdeau and Boyes. The productive line of Boyes, Barkov and Sean Bergenheim – the B Line – had an impressive shift midway in the second period that gave Florida a 1-0 lead. Bergenheim came up short of the red line but sent the puck along the boards and past the Florida bench. Girardi was the first to the puck, but the defenseman flipped it right to Barkov behind the visitor’s net. Barkov fed Boyes, who made a move that opened up Lundqvist and beat him 5-hole at 9:18 for his 10th goal. New York coach Alain Vigneault had nothing but praise for the Panthers following the game. “That team is playing real well. They’re playing fast. They’ve got a real strong transition game. I had watched their game against Montreal and we had talked about it prior to the game tonight (that) we had to take away some of that transition,” the first-year Rangers coach said. NOTES: Florida tied a franchise record for most points in December with 17; it’s the fourth time the Panthers have done turned the feat…Boyes scored for just the second time in his last 18 games…Barkov holds a four-game point streak, the longest of his career…D Dylan Olsen recorded seven hits and five blocked shots…Florida hosts Nashville Saturday night to close out the five-game homestand then embarks for three roads tests – Montreal (1-6, Mon. ), Buffalo (1-9) and New Jersey (1-11)…Thomas recorded his 11,000th NHL save against Winnipeg on Dec. 5. He entered the game 14th among NHL goalies with 11,024 saves…Entering the game, Florida had posted their 15 wins against teams with a combined record of 271-165-63. That assessment comes after watching Olsen for just nine games with the Panthers following his trade along with fellow former Blackhawk Jimmy Hayes, also playing impressively, for Kris Versteeg. Later while all of the media was drawn to the forward side of the room because of the 10-round epic shootout, I kept peering over to the defensive side where Olsen was nowhere to be found. After talking to Jonathan Huberdeau about his Barkov-like move and listening to Tomas Kopecky describe his game-winning shot that beat Washington’s Philipp Grubauer, I finally saw Olsen and headed over. Olsen, who has seven points (3 goals, 4 assists), is known as a defensive-oriented defenseman, but you wouldn’t have known it early in second period. After Huberdeau and Nick Bjugstad kept the puck in the Caps’ end, Kopecky took a pass from the Calder winner and had his shot from the slot deflected by Alex Ovechkin. Olsen corralled the puck and fired the game’s first goal past Grubauer from a bad angle near the bottom of the left circle. The goal gave Olsen, a 2009 first-round draft pick (28th overall), a 5-game point streak, which is quite a surprise for a player who had two goals during his 69-game AHL career. Olsen has brought a physical, responsible defensive game and has stood out with partner Erik Gudbranson, whom he played with at the U18 tournament at Fargo in 2009 and in the World Junior Championships at Buffalo in 2011. For a moment, forget about the deal with Chicago that current Panthers GM Dale Tallon made with his former organization. Olsen and Hayes have been exceptional with Florida in their brief time, while Chicago has Versteeg in their bottom six. The Panthers made out well in the deal, and the Blackhawks are super talented and won’t miss Olsen and Hayes — right now at least. “It’s kind of weird,” Olsen replied with a chuckle. “This has never happened to me before, having put up points like this. I guess you could call it kind of lucky, but it’s been going really well. The forwards are dominating down low and grinding out their players. Obviously, playing with Gudbranson and shutting down other teams’ top lines and playing well defensively is really contributing to our offensive success. After watching NHL Tonight, I realized why Olsen wasn’t immediately available. He was doing an Arena Cam interview with anchor Kathryn Tappen for the late night wrap-up show. At one point before Olsen’s spot came on, a graphic popped up promoting the 22-year-old Calgary native: Coming Up…Dylan Olsen. Good to see the kid getting the publicity for the contributions and impact he’s made with the Panthers. I called it a night early on Thursday. After a long day of work, I shut it down about 9:30, which, of course, means I awoke seven hours later. I immediately checked my email and discovered that veteran winger Kris Versteeg had been traded by Florida to Chicago. I saw the other names involved, made a kind of “meh” sound, rolled over and shut my eyes again. That’s what Versteeg had come to mean to the Panthers, at least in my book: Not worth losing any sleep over. While it would be easy to knock Versteeg and his play – creative and with a sizzling finishing touch when it’s good; turnover-prone, pointless and usually featuring a lot of senseless overskating when it’s bad – the now 2-time Blackhawk played an important role in Florida’s Southeast Division-winning team two years ago. And forget about “loser points” and qualifying what happened in that division. Florida won that banner and earned it, and it will hang in BB&T Center (and the future names of the building) forever. As bad as that division was, someone still had to win it. Plus, imagine the disappointment Panthers’ fans would’ve endured if the club had blown it that last home game against Carolina after holding the division lead for so long? Again, I’m happy with that banner. And it wouldn’t have been possible, simply no if, ands or buts whatsoever, without Steeger. He played on a top line with center Stephen Weiss and fellow winger Tomas Fleischmann on a line that was the most productive in the NHL the first third of the season and terrorized opposing defenses. When Florida Panthers GM Dale Tallon finally made his appearance on Friday morning’s conference call with the media, he sounded like a frustrated man – a man who has tried and tried to find answers with scoring, defense and goaltending but come up empty every time. Well, most every time. There have been successes along the way this season. Jesse Winchester has been the best Panther on the ice most of the year, and former Bruins Brad Boyes and Tim Thomas have played well. Scottie Upshall has stepped up his game, and Nick Bjugstad’s progress and standout play means his time in San Antonio is officially over. I hope he visited the Alamo because he’s not going back during hockey season. Now, it’s on Tallon. Sure, he signed Versteeg to that contract and the organization will eat half of the remaining contract, which doesn’t appear so great, but that deal also helped raise that banner that’s hanging in the rafters. He couldn’t have anticipated the forward’s hip and knee injuries, which have hampered Versteeg for two seasons, limited his production and devalued him immensely. And Tallon has other deals out there worse than this one. But this was all he was going to get for Versteeg: an AHLish forward with some promise and a late first-round defenseman, both with imposing builds and in the bigger, stronger, tougher mold Tallon wants. “We’ve got to turn this this around. I only know one way to do it. I want to win now, too,” Tallon replied when asked about how the fans feel. Now, to a degree, Tallon is on the clock. He has traded out his first player during a dismal season, and it’s a popular Panther. The frustration is seemingly growing, he doesn’t have much value in players he probably wants to get rid of, and there’s likely way too much of a bad season remaining, one filled with way too many 1-goal losses and “what ifs.” Whatever magic he possesses needs to be conjured to fix this mess somehow by dealing players, dipping down to San Antonio for Trocheck or Shore, or packaging some kind of deal that will make this team better. Tallon’s reason for trading Versteeg was simple: It’s a performance-based business where results mean you either stay or go, and Kris wasn’t getting it done at all and was just basically filling a spot someone else could be playing. Now the onus is on Tallon to work the phones even harder and keep the Panthers from transforming into the league’s laughingstock. Or he will go down trying.